SAUGERTIES, NY (September 8, 2015): Sunday at HITS-on-the-Hudson in Saugerties, New York was anything but an average day of show jumping competition. 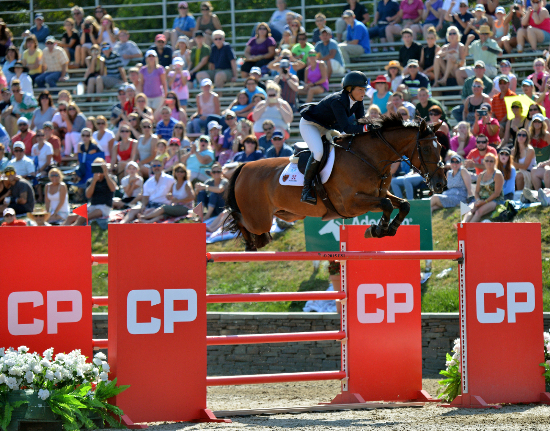 Horse sport royalty descended on the Hudson Valley for the nation’s highest ranked class of the year, the Canadian Pacific $1 Million Grand Prix FEI-CSI 5*, presented by Wells Fargo. Only one would be so lucky to return home with the big check and blue ribbon, and that one was none other than Beezie Madden, of Cazenovia, New York, aboard her iconic mount Simon, owned by Abigail Wexner. Thousands of spectators filled the grandstand and hundreds more watched from the Legend VIP to get a glimpse of the historic event before them. The sixth annual seven-figure Grand Prix held in Saugerties, debuted as a FEI CSI-5* on September 6 and attracted the top riders from across the world. They carefully completed the course with no jumping faults, but in a time of 94.650, just four seconds over the time allowed, leaving them with two time faults and the lead. They weaved through the course, navigating their way over the tricky Liverpool and above the sizeable triple bar that many others had trouble with. The crowd erupted in cheers as Madden crossed the timers with a clear track behind her and a time of 88.320 to bump Ruus from the top. Eager to make this his third $1 Million Grand Prix victory, Ward zipped through the course but had a rail at C of the triple for four faults and a time of 84.500 for third place. From any seat in the house, Madden’s beaming smile prevailed as she reappeared for her victory gallop and took center stage once again. It was unanimous amongst the top finishers the impact 5* classes have on the sport and they graciously gave credit to HITS President and CEO Tom Struzzieri, as well as the sponsors. Beezie Madden, of Cazenovia, New York, and Abigail Wexner's Simon claim the CP $1 Million Grand Prix FEI CSI-5*, presented by Wells Fargo on September 6, 2015 at HITS-on-the-Hudson in Saugerties, New York.